This almond candy is a traditional wedding candy. The bitterness and sweetness represent the bitterness and sweetness of marrige where in the sweetness is greater than the bitterness. Each almond is coated in a pastel crunchy candy shell. 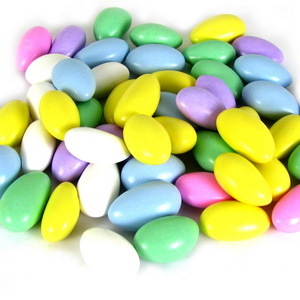 Sugar, almonds, tapioca dextrin, artificial flavor, artificial colors (red #3, yellow #5 lake, blue #1 & #2 lake, titanium dioxide), confectioner's glaze, and carnuba wax.